Summer is here! 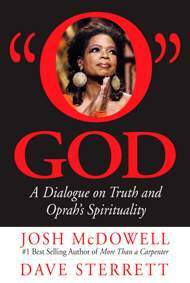 If you’re looking for some light reading that helps you understand where a lot of people are coming from when they think about spirituality, check out the book by Josh McDowell and Dave Sterret that’s been getting a lot of press recently: “O” God: A Dialogue on Truth and Oprah’s Spirituality. Even though this was published in 2009, it’s still as relevant as ever. Why? Because 60 percent of Americans who don’t go to church often get their ideas about God from TV, movies and music. During the final episode of the Oprah Winfrey Show, Oprah credited Jesus for her success. She even said, “Nothing but the hand of God has made this possible for me.” But do we really understand Oprah’s spiritual teachings? This is what the authors respectfully examine through a disarming novel centered around the personal conversations of two young women: A law student named Lindsey, and a philosophy student named Avatari. Though their discussions, the reader gets a look into Oprah’s spirituality and the teachings of her friends as popularized on the Oprah Winfrey Show, O Magazine, Oprah.com and huge bestsellers like Eat, Pray, Love, The Secret, and The Power of Now. If you’ve never read these books, but have heard bits and pieces about them, I highly recommend picking up “O” God. You’ll absolutely love sitting in on the book club discussions that cut right to the case. A former Hindu, Avatari seems to be a well-read Christian who brings apologetic ideas from the likes of Paul Copan, William Lane Craig and Dinesh D’Souza to bear on relativistic ideas. If her statement is simply relatively true, then it may not be true for anyone else, so why should any of us consider it a valid opinion? If that statement is absolutely true, she has embraced that ideology herself. An excellent point. But she’s interrupted by another character in the book, saying, “Hold up. You’re getting over my head.” Indeed. Pieces of dialogue like this may be tough for some in Oprah’s main demographic to fully grasp the first time they read it. I’m thinking of specific relatives of mine who would really benefit from this book, but may struggle a bit with some of the ideas. Still, at just 124 pages, this is a readable book that’s well worth your time. It will help you understand where a lot of everyday people are coming from when they talk about spirituality. The apologetics arguments are well-thought out and often presented in such a way that you could actually use in every conversations. You’ll get ideas for gentle but direct talk the nature of truth, morality, reincarnation, the resurrection of Jesus and more. Apologetics, Book Review, God's View vs. World View, Good Reads, Guest Blogs, What Is Truth?